George Waring scored on his debut but it wasn’t enough to earn FC Halifax Town a first win in five games today. The Shaymen had to settle for a 1-1 draw against joint-bottom of the table Torquay United on a frustrating afternoon at The Shay. Tranmere Rovers striker Waring signed a loan deal hours before kick-off and his 68th minute close-range finish appeared set to give the Shaymen a valuable victory. However, the Gulls had belied their lowly status throughout the contest and equalised eight minutes later when Jamie Reid fired home after Rhys Murphy’s header had struck the post. Waring, who came in for Adam Morgan, was one of two changes which Billy Heath made to a starting 11 that had timidly bowed out of the FA Cup to Tranmere the previous weekend. Matty Kosylo, available after a one-match suspension, came in for the injured Josh Macdonald. The loanee was in the thick of the action from the first whistle as he combined neatly with strike partner Ben Tomlinson, only for the latter’s shot to drift off target. Torquay responded when Luke Young found Ryan Higgins but his drive flew into the safe arms of Sam Johnson. The action quickly swung to the other end when a trademark run from Kosylo ended with his shot deflected over. From the resulting corner, Connor Oliver’s curler was blocked by his own team-mate, Nathan Hotte. Murphy’s low shot from 25 yards then went agonisingly wide for the visitors before the game turned into a scrappy affair. However, it was United who had the better of the opportunities for the remainder of the half. Young fired a free kick straight at Johnson, who then flapped at a corner but Callum Evans couldn’t take advantage from the edge of the box. Johnson then seemingly handled outside of his box but, despite the strong protests from the visiting bench, referee Simeon Lucas waved play on. The official then refused to blow his whistle when Matty Brown appeared to have his shirt pulled in the area. Seconds later, Waring did well to find the advancing Hotte who went to ground, but again no penalty was given. Josh Wilde produced a vital interception to deny a certain Torquay goal before Johnson saved well from Young on the stroke of half-time. The Town stopper had to be at his best soon after the restart, producing a brilliant save with his legs after Liam Davis had rampaged down the left. As the heavens opened in the second half, Halifax searched for divine inspiration and they got it courtesy of Waring with just less than 20 minutes remaining. A hopeful Connor Oliver free kick was pumped into the Torquay box and, after the defence had failed to clear, Waring was on hand to open the scoring from inside the six yard box. 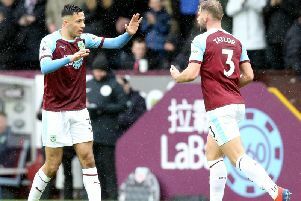 It was the striker’s second debut goal of his career after he netted in his first game during a loan spell at Barnsley in 2015. It also meant that Torquay are still searching for their first clean sheet on their travels this season. The visitors, however, refused to let their heads drop and Johnson, not for the first time during the afternoon’s proceedings, had to be alert to deny another Young free kick. Town’s lead was eventually cancelled out in the 76th minute when Reid found himself in the right place at the right time to find the net after Murphy’s header from a corner had cannoned off the base of the far post. The Shaymen responded valiantly but a magnificent run and shot from Kosylo was parried to safety by Vincent Dorel before Brown headed wide in the dying moments, leaving Town with only one win in their last seven outings.